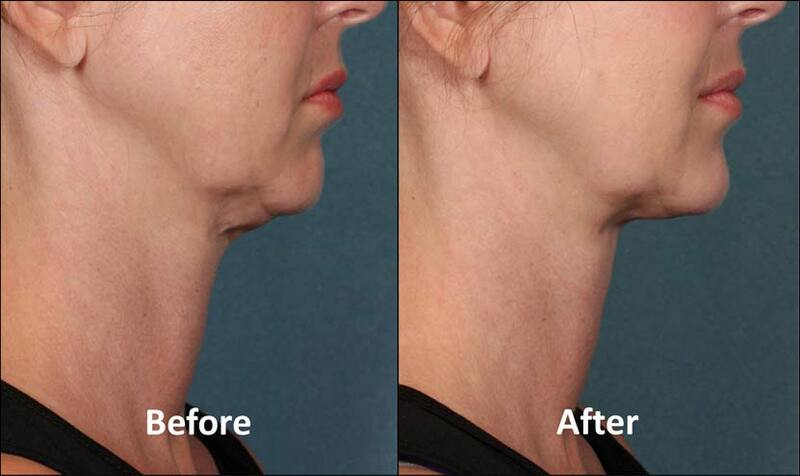 Kybella Dissolves & Melts the Double Chin. No Surgery or Recovery. It’s Safe & Easy! KYBELLA is the first and only FDA-approved1 nonsurgical treatment for the double chin. Kybella melts fat under the chin, contouring and flattening this problem area without surgery. Destroys fat cells beneath your chin. Once the fat is gone it does not come back! So How Does KYBELLA™ work? The active ingredient in KYBELLA is deoxycholic acid, a naturally occurring molecule in the body that aids in the breakdown and absorption of dietary fat. When this molecule is injected into the fat beneath your chin, it destroys fat cells. Once destroyed, these fat cells can no longer store or accumulate fat making it a solution to the double chin. Is KYBELLA™ right for Me? KYBELLA™ is just a 20 – 30 minute in-office treatment session. Simple injections into fat under your chin melt fat away. You and your New Radiance Kybella Expert will customize your Kybella treatment based on the amount of submental fullness you have and your treatment goals. Together we can help you win the fight against that double chin. For most patients, downtime was minimal and occurred most commonly after the first treatment session. When scheduling your treatments, keep your social plans and work commitments in mind. KYBELLA™ enjoys a Great Rating on RealSelf Patient Reviews – Click the Image above to see what people are saying about KYBELLA.